I’m breaking from formula here. The Napa/Sonoma Valley have so many restaurant/wineries that are amazing, that I can’t just offer a simple list of what to do. This post is also being written on spec for Gary, a dragon boat team member who will be traveling to the area after the SFO festival this September, so I want to be as thorough as possible for him. 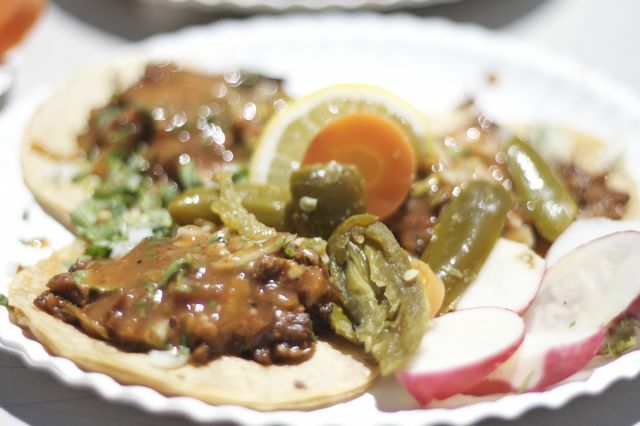 For starters… If your flight happens to fly into OAK, you must stop at the Sinaloa trucks at 21st and International. There are 2 different taco trucks, 1 for fish and the other for meats. 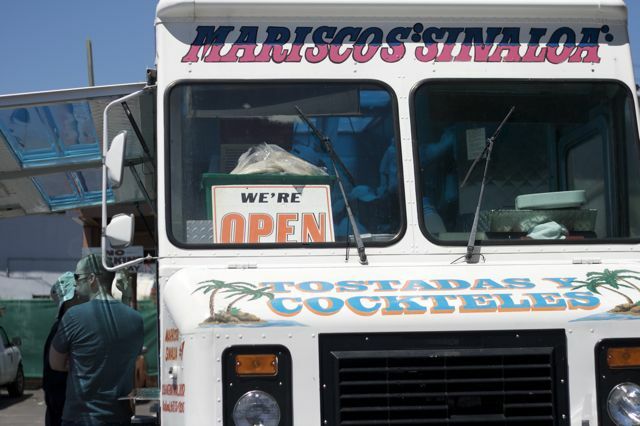 The Mariscos Sinaloa truck sits next to the oranage Tacos Sinaloas truck on the corner of 22nd and International Boulevard in Oakland. 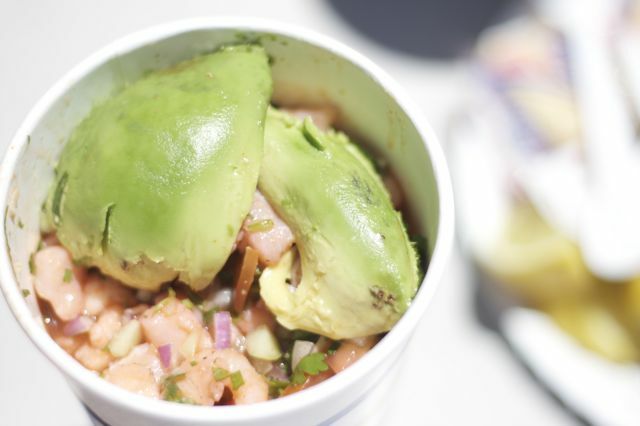 Order the fish ceviche, its some of the best Ive ever had. They traditionally served it on a plate with tortilla chips, we had ours served in a cup. Either way, the fish is so brightly acidic and fresh, which is surprising since its ladled out of a big Rubbermaid container. The chorizo taco was spicy and good but the winner was the Al Pastor! If you land in SFO or are heading up to wine country over the Golden Gate Bridge on to Sonoma, make a stop at Hamburgers in Sausalito. Take out a gigantic burger and eat it on a park bench overlooking the beautiful Bay area. It may not be “the best burger you’ve ever had” but it will definitely be memorable. Napa and Sonoma are amazing place to experience wine and food. There are more places to experience than can be done in 36 hours, or even a week. I’ll try to include as many as I can so you have options. Enjoy the journey of wine tasting. It’s not a sprint. I used to want to hit every single stop. I’ve learned now, my palate can take 3-4 stops max in the day. No worries though, spend the rest of your time enjoying everything else the area has to offer. If you are the type of person who enjoys biking, do it. At least for a day. Not only does it eliminate the drinking and driving worries, I’ve heard it’s fun. Don’t be afraid to ask questions at tasting rooms and don’t feel intimidated by the staff or the process. I’ve had wonderful experiences in the places I’m going to mention in this post. Don’t feel bad if the wine isn’t to your taste. Everyone’s palate is different. But at the same time, don’t limit yourself. Just because you “don’t like Merlot” doesn’t mean you won’t like all Merlots. My father-in-law gave me the great idea of looking at the wine lists of the restaurants you go to which may lead you to interesting places that you may not have thought of. Talk to the sommeliers to get suggestions. We were lucky enough to be given the The French Laundry wine list after our meal there. We looked at the wineries that had multiple wines on the list and used it as our guide for travel. That wine list was also a fantastic entry to the tasting rooms whenever we went. Don’t feel bad for sharing a tasting. Plan in advance a few wineries you want to visit and make appointments, but leave room for other people’s suggestions. I found yelp.com very helpful to get a feel for the wineries on my list. This is the hardest one for me; don’t feel bad for not buying anything at the winery if the wines aren’t to your liking. You probably had to pay for a tasting anyways, so it’s not like they didn’t get any of your money. The best bang for the buck for accommodations in the area is to stay in the town of Napa. I think it’s a bit far south to make it home base, but if you’re thinking of moving each night through your time in the valley, staying here a night or 2 isn’t bad. I got a fantastic deal on Priceline last year at the beautiful Avia hotel and it was very lovely. If you happen to be in town for dinner, the Azzurro Pizzeria was good, although I really wanted to go to La Mixteca for some mexican. Check out the farmer’s market if you can on Tuesday or Saturday morning, and go into the Oxbow Public Market for some great happy hour specials. Clos Du Val – they make my favorite go to “special wine”, which is over $30 at home, but I can pick up at US Costco’s for $20. I had high expectations for this winery and it was our first stop on our last visit. The tasting room was pleasant, but can get very busy. I don’t think we got the most knowledgeable or outgoing server, which can make or break your experience. I didn’t find anything there that I needed to bring home with me, although I still do love their Cabernet! Elyse Winery – it’s small, so call ahead for reservations. The staff are very connected to the family who makes the wine and are able to give you the background so you get a sense of the passion that is put into every bottle. The tasting room is relaxed and unpretentious and leaves you with the feeling that this winery is special. To top it off, they are making wonderful reds. The tasting fee is $10 and includes around 6-8 wines but waived with purchase. One of my favorites from my last trip was the C’est Si Bon. We drank it one night during our stay, and it was absolutely wonderful. I also have a Cabernet and Petite Sirah waiting patiently for the right time for me to enjoy them. The town of Yountville is fairly small but for the dining options alone, it’s worth a stop. Make sure you visit the V Wine Cellar where they have an amazing selection of wine and very knowledgeable staff who will not only guide you through the store but offer fantastic winery suggestions as well. We were lucky enough to fulfill one of my dreams on our last visit at The French Laundry, but if that’s a bit out of your price range try to score a reservation at Ad Hoc or Bouchon. 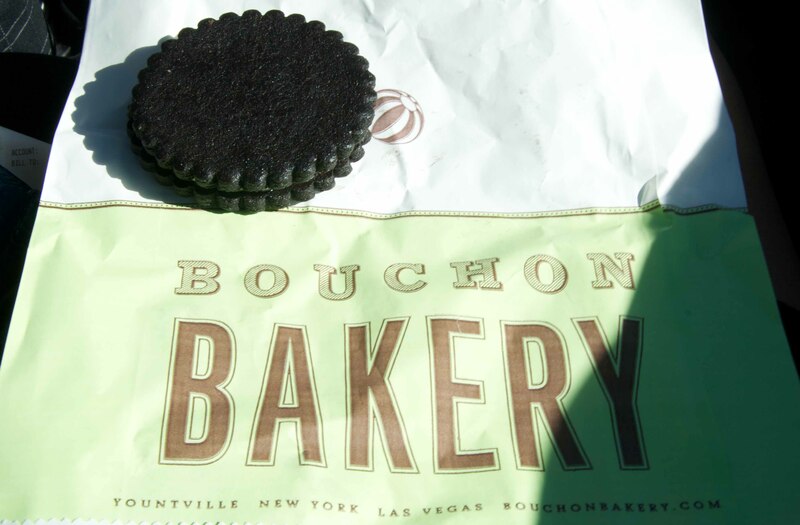 The Bouchon bakery is a great place to pick up a mid-afternoon treat. The TKO cookie was exactly what I needed after a long day of wine tasting. I’m a bit of a Top Chef nut, and loved Michael Chiarello on the Master’s show. 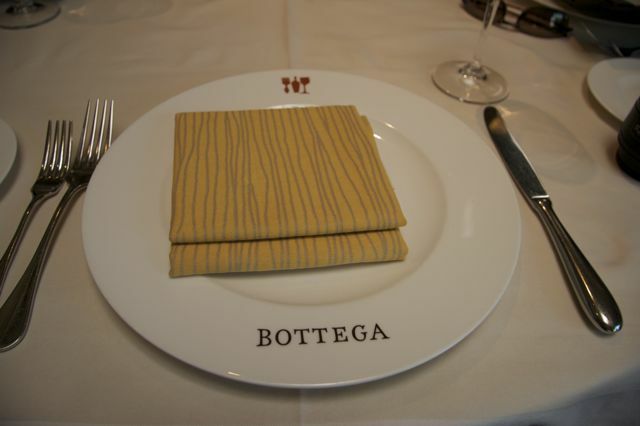 I drooled over the dishes he made in the finale and had to go to Bottega to try them out. 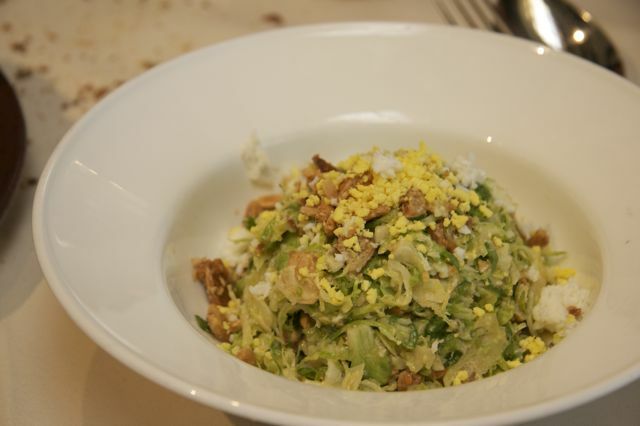 Shredded brussels sprout salad with great crunch and bite. 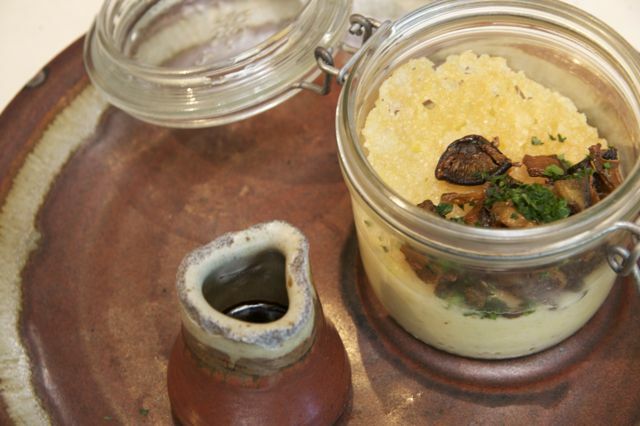 Warm creamy polenta under glass with caramelized mushrooms. Im a sucker for soft polenta, so I absolutely loved this. The judges oooohd and awwwwd over Chiarellos gnocchi in the finale as well. 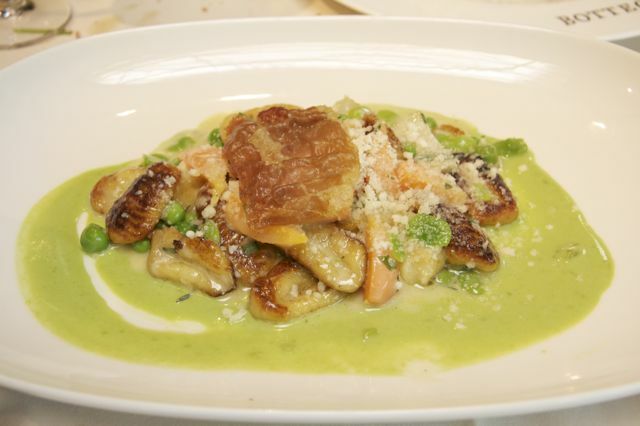 Pillowy soft and delicately sauced with a sweet pea puree, it was definitely Mmmmmmm! 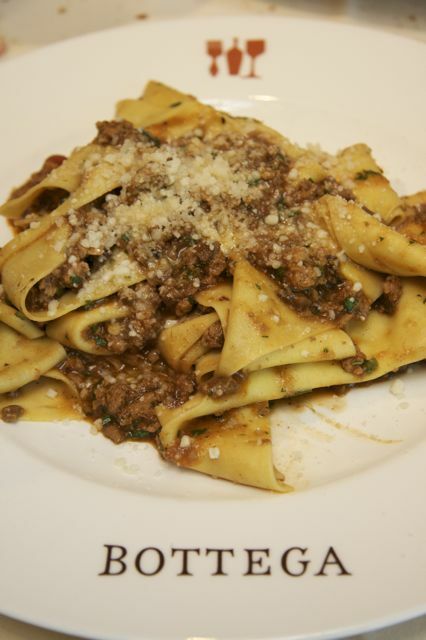 The Pappardelle Bolognese was pretty heavenly as well. Biale Winery: Recommended by someone at V Cellars, (and also on the wine list for the French Laundry), they have some some amazing Zinfandels coming out of this little winery, (and before you turn your nose up about Zins, remember what I said above). Down a gravel road, this stop was also one of my favorites. Mama Biale was in the shop as we were tasting, which made the experience even better. This is the meat of the valley where the St Helena Hwy starts looking like a strip mall of wineries. If you’ve never visited the area before and want to hit some of the Biggies, go on a tour of Mondavi, the grounds are beautiful and although you’ll be herded around like cattle, the wine at the end is pretty tasty. Another fun, but large-scale experience can be had at Mumm where you can enjoy a tasting of bubbly on their magnificent patio overlooking the vineyard. There’s something about sipping a glass of sparkling in that environment that will make you feel like Life is Good. In St Helena, make a stop at the St Helena Olive Oil Company to taste some delicious olive oils and vinegars. Their Balsamic Vinegar of Modena always ends up coming home with me. For a nice restaurant in St Helena, try Terra. Serving slightly Asian fusion seafood cuisine, this is the place to go for a romantic dinner. If you’re tired of the traffic jam on the St Helena Hwy stop in for a fun road-side experience at Gott’s Roadside, (formerly known as Taylor’s Automatic Refresher) where you can order a hamburger medium rare if that’s how you like it. Order a side of onion rings because I said so. I also have a list of places that I’ve visited that were good, not great and some that I didn’t like for one reason or another, but won’t bother to include it here. But like I said, everyone has their own tastes, and so just because I did or didn’t like something doesn’t mean you won’t. A fantastic printable map of the area to help plan out your wine tasting adventure can be found here. I don’t know which one I want to try more, the truck stop ceviche or the polenta!